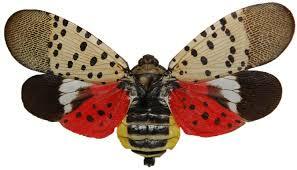 Alsace Township is currently in the quarantine area for the Spotted Lanternfly. The Spotted Lanternfly, Lycorma delicatula (White), an invasive planthopper, has been discovered in Berks County, PA. It is native to China, India, Vietnam, and introduced to Korea where it has become a major pest. This insect has the potential to greatly impact the grape, hops and logging industries. Early detection is vital for the protection of Pennsylvania businesses and agriculture. Trees, such as tree of heaven and willow, will develop weeping wounds. These wounds will leave a greyish or black trail along the trunk. This sap will attract other insects to feed, notably wasps and ants. In late fall, adults will lay egg masses on host trees and nearby smooth surfaces like stone, outdoor furniture, vehicles, and structures. Newly laid egg masses have a grey mud-like covering which can take on a dry cracked appearance over time. Old egg masses appear as rows of 30-50 brownish seed-like deposits in 4-7 columns on the trunk, roughly an inch long. If you see egg masses, scrape them off, double bag them and throw them away. You can also place the eggs into alcohol or hand sanitizer to kill them. Please report all destroyed egg masses on our website. Collect a specimen: Specimens of any life stage can be turned in to the Pennsylvania Department of Agriculture’s Entomology lab for verification. Take a picture: A photograph of any life stage (including egg masses) can be submitted to Badbug@pa.gov. Report a site: If you can’t take a specimen or photograph, call the Automated Invasive Species Report Line at 1-866-253-7189 and leave a message detailing your sighting and contact information.